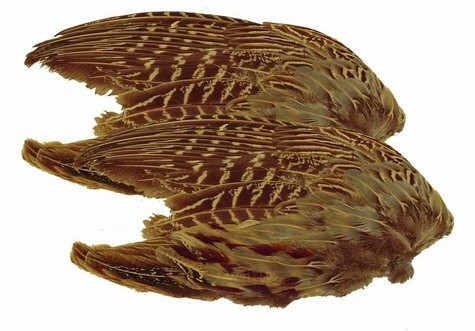 Pheasant Wings -- 2 Pack. $3.99. Great quality. Will order more. "12 week old pup started pointing immediately." NIce quality. 12 week old pup started pointing immediately. "My pup is only 8 weeks old but starting to point these wings." As advertised. My pup is only 8 weeks old but starting to point these wings. Definitely a good investment for training. "Great wings and very nice quality." Great wings and very nice quality. "Great training tool for my lab." Great training tool for my lab. "The pheasant wings are great quality." Thankful I found you. The Name plate, collar are good. The pheasant wings are great quality. Will purchase again in the future. "Service and product the best I've had." Service and product the best I've had. Great experience. ...as my pup continues his training I will be purchasing more and more! Works great!! Just tied these pheasant wings to his dummies, and that's all. Watching a 4 month old work that nose is AMAZING. Very nice shape. Puppy loves them! Fast service!! Zip tied the wings to my dummy, very durable so far. Excellent quality! Great wings, arrived within two days of ordering! "My pup started pointing the wing at 13 weeks." My pup started pointing the wing at 13 weeks. She also follows the trail left by dragging it across the ground. Seems to work well. Top quality. My pup loves to sniff these out when I hide them. Arrived on time. "My puppies love working with the wings." My puppies love working with the wings. Good price. They held together well taped to a bumper after many retrieves. Dog picked up the scent well. "They work great for training." They work great for training. "They were good and did the job that I expected." They were good and did the job that I expected. Very affordable. Great shape. The only problem was they gave me two wings from the same side. Well preserved, feathers aren't falling off. My pup is 13 weeks old and gets a little excited about chasing the wing around but as far as searching for it he doesn't seem real interested. I even tried to put some of the pheasant scent on it that helped out a bit just not sure if it is the pup or if there is any natural scent left on the wings.